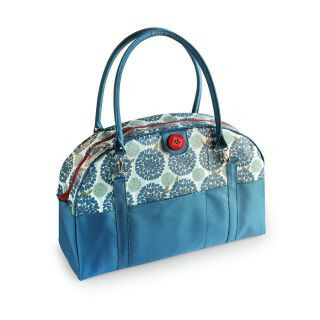 This is the Peacock Mum Coop Carry-All Diaper Bag from 2 Red Hens. I searched countless websites until I finally settled on this bag. I loved it because it was sturdy, got great reviews, looked feminine but still neutral enough for my husband to carry and I could fit everything I need inside. Now that our baby is here, my husband carries a daddy diaper backpack instead of using my bag. And I have decided that diaper bags filled to the brim with every essential on-the-go items are really bulky and annoying to carry. Especially when you have your own purse (though I’ve ditched that on occasion and simply threw what I needed into the diaper bag), a car seat and shopping cart/ high chair cover to lug around everywhere you go. So this beautiful diaper bag that I splurged on will now sit in my car when we’re on the move to hold emergency items. I plan on getting a big, comfy tote bag that will fit my personal items and a diaper, wipes, bottle and changing pad for easy accommodation in restaurants and stores. We’ll see how that goes! Previous PostI’m a vegetarian and just fed my baby meat!